When it comes to your pet’s health care, Bell Veterinary Hospital believes in giving you options—from the best of traditional veterinary medicine to the latest technologies that have proven effective in relieving pain, speeding healing and restoring health. That’s why we offer laser therapy as part of our comprehensive suite of services. Low-level or “cold” laser therapy focuses red and infrared light on tissue at and below the surface of the skin. The light energizes the cells, producing a structural protein called collagen used to repair tissue. Lasers continue to promote healing by supporting vascular dilation and synthesis, increasing blood circulation to the affected region. The stimulation also releases the body’s own pain-relieving hormones. The process generally takes between 5-10 minutes and continues to relieve pain and fight inflammation for up to 24 hours following the session. Most patients see positive effects after 3-5 uses, but depending on your pet’s condition and its severity, individual results will vary. Once our doctors have had a chance to evaluate your pet’s condition, we can give you a more specific treatment plan. 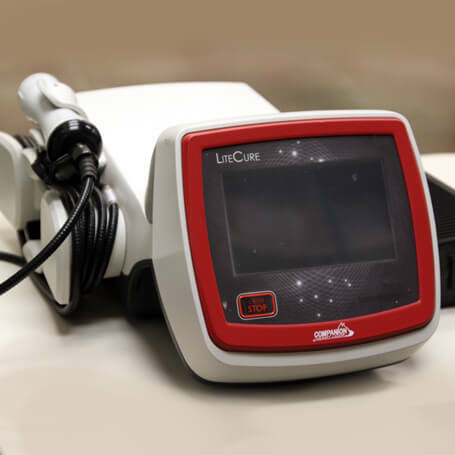 Laser therapy is normally combined with other types of veterinary treatments including medication and physical therapy. Its effectiveness along with the lack of side effects have made laser therapy the preferred post-operative rehab method in veterinary medicine. Want to know if laser therapy could help your pet? Schedule a consultation online or call us at (205) 709-8286.